Here we will show you a Motion Compound cable cam complete set incl. 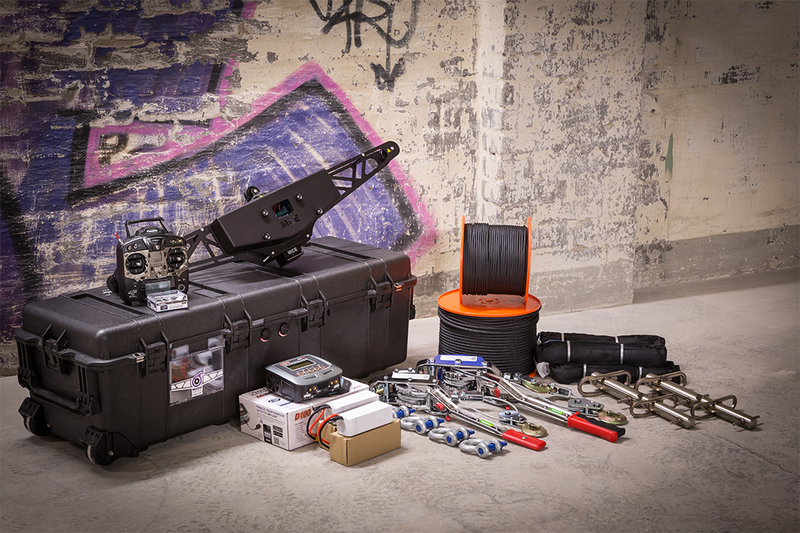 MCE case 2.0 (pelicase) and the MCE rigging kit. So everything is packaged safely for transport and the rigging is finish in minutes. The MCE drive unit comes with the MCE QR-Mount. This is our variable quick release system, compatible with all DJI Ronin, all Freefly Mövi and many other professionaly deployed camera stabilizers. The supplied remote control has been programmed and set. A second receiver for each gimbal is included and is installed in a short time on your DJI or Freefly camera stabilizer. All parts are of the highest quality and have been tested by us for many years of experience in our own productions. Ready for shoot, out of the box.